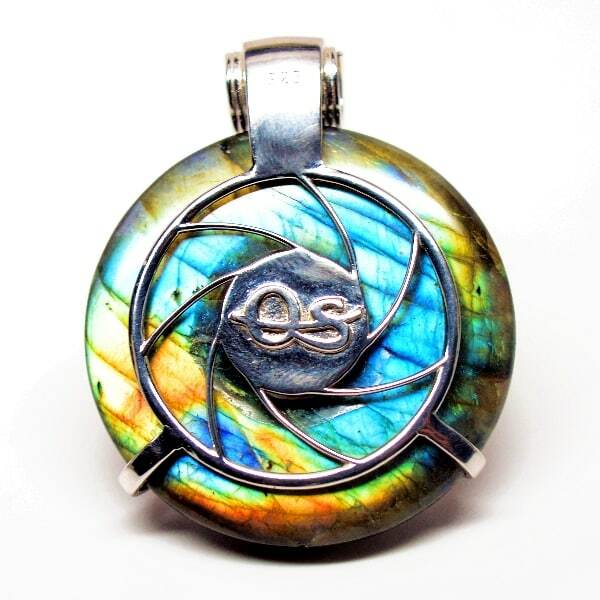 It’s simply undeniable that this reversible, one-of-a-kind rainbow labradorite captures the premier iridescent qualities of the authentic Ethiopian Welo opal scarab body. 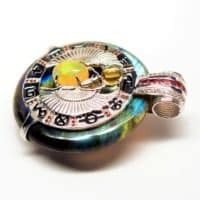 Blue and green luminescence throughout the torus base stone and glorious golden and orange veins are radiated by .925 silver, citrine, garnet and white topaz adornments, simply make this piece a showstopper. 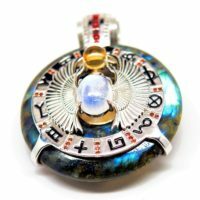 Deserving of any collection, this Rainbow Labradorite stone laden with powerful cleansing and elevating stones and the ancient Egyptian scarab beetle can become your illuminated guide to cosmic and earthly connections. 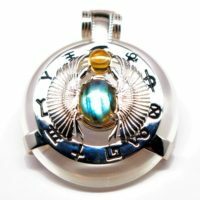 The ancient Egyptian scarab is known as a restorer of life and a keeper of cosmic knowledge, which is why it is symbolically used today by those seeking spiritual illumination and protection. 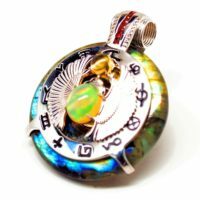 When combined with the divine and mystical qualities of rainbow labradorite and the protective qualities of opals, this beautiful pendant can also be used to help increase one’s sense of worth and realize their full potential. 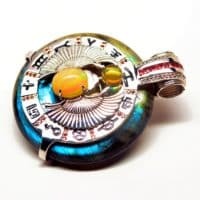 Further promoting cleansing and restoration of the mind, body and spirit are authentic garnets, a round citrine, and white topaz crystals that cleanse negative energies and boost creativity and manifestation abilities. Enjoy two stunning looks in one superior pendant with a newly designed logo and captivating spiral swirl upon the reverse side. 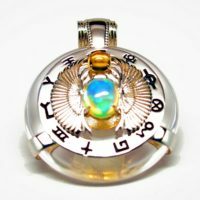 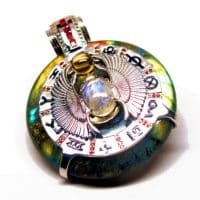 We have also added small magnets inside the center of the torus behind the Welo opal body to amplify the energy and resonance of the amulet. 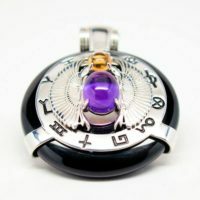 Our design team also let the cosmos determine the Tarot symbols that surround the all-mighty scarab. 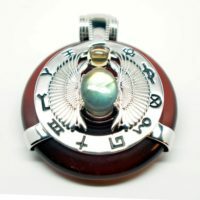 Learn more about the meaning of the symbols here. 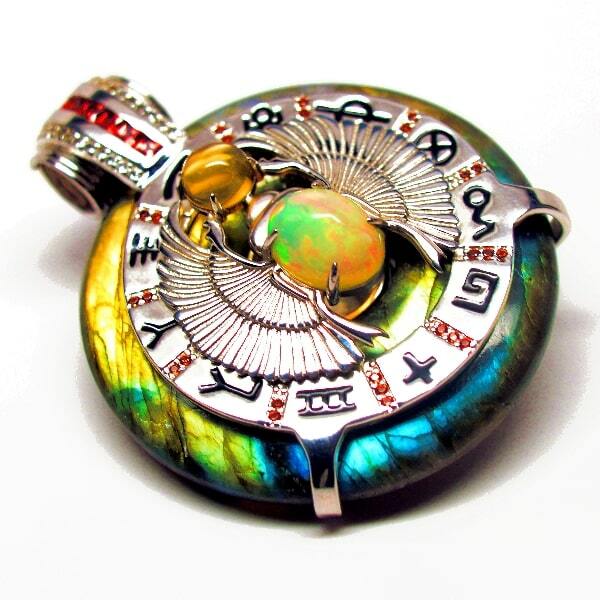 This beautiful amulet won’t last long on our site, but it can bring a lifetime of pleasure for you! 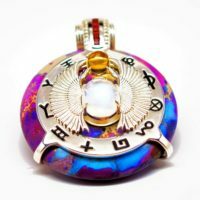 *** Three our powerful exclusive LightShield™ scalar wave frequency programs – The Sound of the Sun, The Sound of Earth, and Shield My Aura. 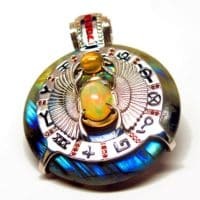 *** Can be customized with additional frequencies. 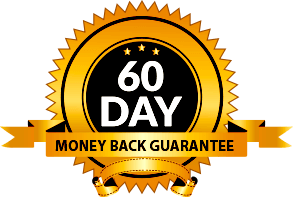 *** A lovely felt presentation and wrap-ready surrounding gift box. 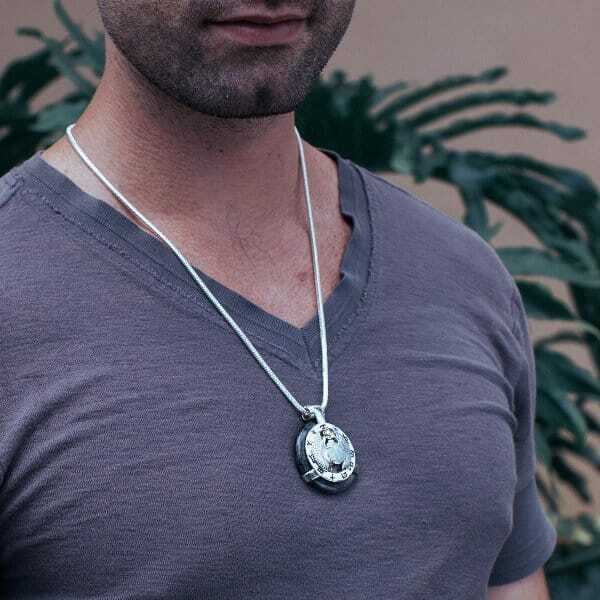 *** Your choice of a leather or stainless steel chain. 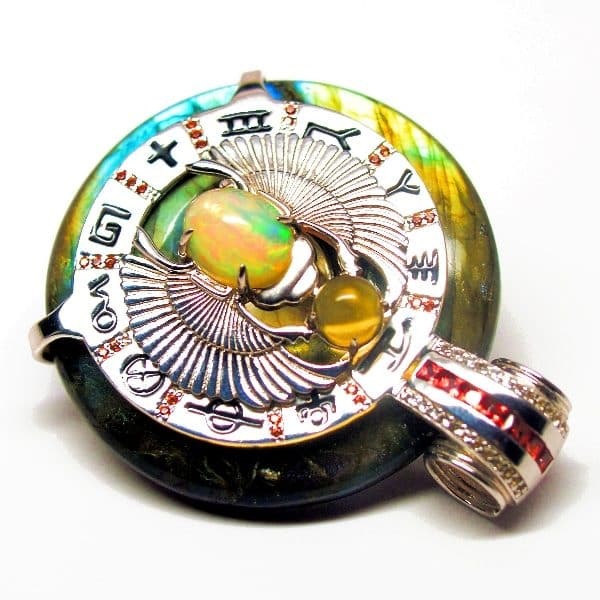 *** A polishing cloth safe for sterling silver adornments that is also safe for many stones. 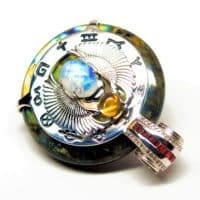 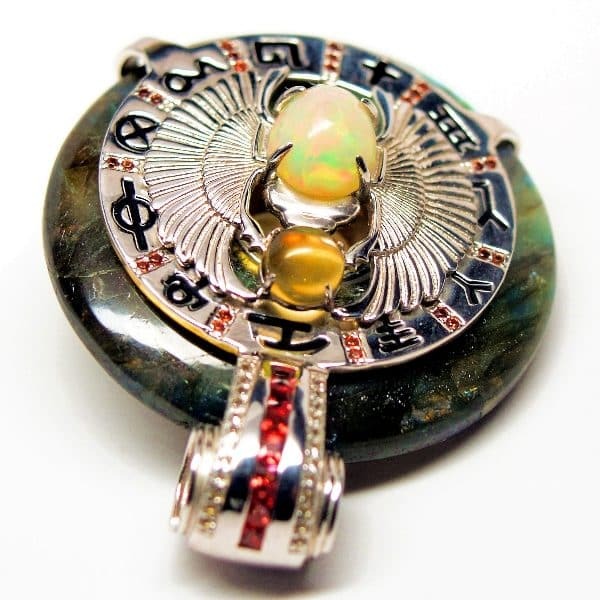 Be the first to review “Rainbow Labradorite w/Opal & Garnet – Scarab Egyptian (C002)” Click here to cancel reply.